Bed and breakfast in Leeds. Leeds prosperity was built on the wool trade and then the textile industry. It is a vibrant city. Joseph Hepworth established the first chain of tailoring stores and later Michael Marks, (Marks & Spencer), opened his first stall at Leeds Kirkstall Markets. The Victorian Quarter is home to Harvey Nichols, Vivienne Westwood. The canal waterfront features a 5 star hotel, 42 the Calls, together with the Royal Armouries Museum. The city offers a wealth of galleries and museums. Also see Leeds & Leeds attractions. 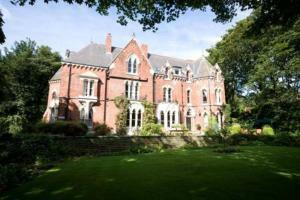 For bed and breakfast in other areas near to Leeds see bed and breakfast in Bradford, & bed and breakfast in Harrogate. Headingley Lodge forms part of the Headingley Carnegie Complex and has good access to Leeds city centre. Spacious bedrooms are within the stadium and have stunning views of the pitch. Headingley Lodge offers free parking, and is located about 2 miles from the centre of Leeds. Headingley itself is a vibrant area and has plenty of bars and restaurants within walking distance. Bedrooms have an in-room fridge and look onto the rugby and cricket ground. In the heart of Leeds city centre, these stylish and contemporary serviced apartments offer executive luxury without the price tag. 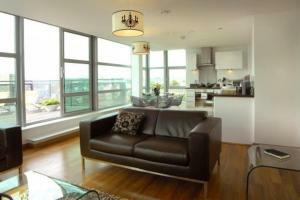 Each of these modern apartments features smart, sleek interior design and modern furnishings. Many of them have a private balcony. Every apartment has a large contemporary bathroom, a living room with dining area and a fully equipped kitchen. The stylish, spacious and comfortable apartments boast all the modern comforts and facilities you need in a relaxing base, whether you are visiting the city for business or for leisure. The apartments are just an easy 10-minute walk from Leeds railway station and the business district and the heart of the city are right on the doorstep. With all the freedom, independence and convenience of an apartment, you can explore and enjoy the city at your leisure. Set in quiet grounds, this small family-run hotel offers comfortable en suite accommodation, free Wi-Fi and free parking less than 1.5 miles (2.5 km) from the city centre. The Cliff Lawn Hotel is close to the University of Leeds and Headingley Stadium, home of Yorkshire County Cricket Club and the city's rugby teams. With good access to the region's major roads, the hotel is ideal for visiting York and Harrogate or the North York Moors and the Yorkshire Dales. Free parking is available for guests in the hotel's private off-road car park, which is protected with security lights and closed-circuit TV. This Victorian building was originally the home of a local mill owner. Each room is attractively decorated and well furnished, with a digital TV and tea/coffee facilities. A full cooked English breakfast is provided. Cliff Lawn Hotel has a lounge and can provide a fully licensed drinks service. The Discovery Inn is in Leeds city centre, next to Leeds Rail Station and close to the shops, bars and restaurants. It has good-value en suite rooms with TVs, tea/coffee and hairdryers. The Discovery Inn - Leeds is close to the financial and business districts of Leeds. The shopping centres, cafes and pubs are a short walk away. The Scarborough pub serves beers, wines and spirits, as well as a selection of bar snacks and food. A continental breakfast is available from 07:00 to 09:30, Monday to Friday, and from 08:00 to 10:00 on Saturdays and Sundays. This modern 3-star hotel is in Leeds city centre, 600 metres from the University of Leeds. It has a brasserie-style restaurant, lounge bar, discounted parking and en suite rooms with flat screen TVs. The Brook Merrion Hotel is less than 10 minutes' walk from both the University of Leeds and Leeds Metropolitan University. Briggate and the Victorian Quarter are also a short walk away. Leeds Rail Station is 0.75 miles from the Merrion Hotel. The financial and business district and the city's shops, bars and clubs are all close by. The Starlets Bar and Restaurant serves modern cuisine and traditional classics. The Merrion has a 24-hour reception desk, 24-hour room service and en suite rooms with hairdryers, ironing facilities and trouser presses. The hotel is only a 5 minute taxi ride from the city. This privately established, period hotel offers great-value en suite accommodation and free Wi-fi access throughout, and is within walking distance of the vibrant suburb if Headingley and university campuses. The hotel is only a 5 minute taxi ride from the city. All of the comfortable accommodation is unique and individually decorated, with each room taking its inspiration from the Victorian and Edwardian eras. The hotel offers good value for money including the bar which has a happy hour with discounted drinks prices, and there is a selection of affordable home-cooked food available, freshly prepared by the hotel's own chef. Perfectly situated just a short walk from the Calls, Granary Wharf and Boar Lane, Roomzzz City offer a range of luxury 1 or 2 bedroom studio apartments. Each luxurious studio/suite has been individually designed to create a stylish interior, with bespoke walnut fitted features and rich textiles. All modern apartments come with an Apple Mac, widescreen LCD TV and integrated safe. The fully-equipped kitchens have contemporary Smeg appliances. Free Wi-Fi internet access and local or national calls are available. There is also a complimentary Grab and Go Breakfast. In reception you will find a pantry where you can pick up basic groceries and toiletries or a ready meal. In a superb location, City Inn Leeds is part of the Granary Wharf area, next to Leeds Train Station and the canal. The Victoria Quarter is a shopping district nearby. City Inn Leeds has comfortable, modern rooms, featuring a stylish multimedia iMac computer, along with complimentary Wi-Fi internet access and satellite TV. The hotel's sleek City Cafe restaurant offers intimate dining and modern European cuisine, while the terrace provides al fresco dining. Enjoy a drink in the Skylounge, with panoramic views of the city or in the lively Granary Lounge. Local attractions include Opera North, Leeds Grand Theatre and Leeds City Square, all within walking distance of the hotel. This modern, friendly, air-conditioned hotel is on the edge of Leeds city centre, ideal for Leeds and Metropolitan universities, the business district and its restaurants and bars. Holiday Inn Express Leeds City Centre is a 15-minute walk from the centre of Leeds. The Holiday Inn Express has refurbished, spacious rooms with a power shower and air conditioning. Headingley Stadium, Leeds United FC and the Leeds International Swimming Pool are nearby. York and Wetherby racecourses are within a 30-to-45-minute drive away.